Cauliflower! Either you love it, or you think it’s just ‘okay’. But I guarantee that everyone will like these BBQ Cauliflower Wings. And because I love them so much, I want to share the recipe with you today. 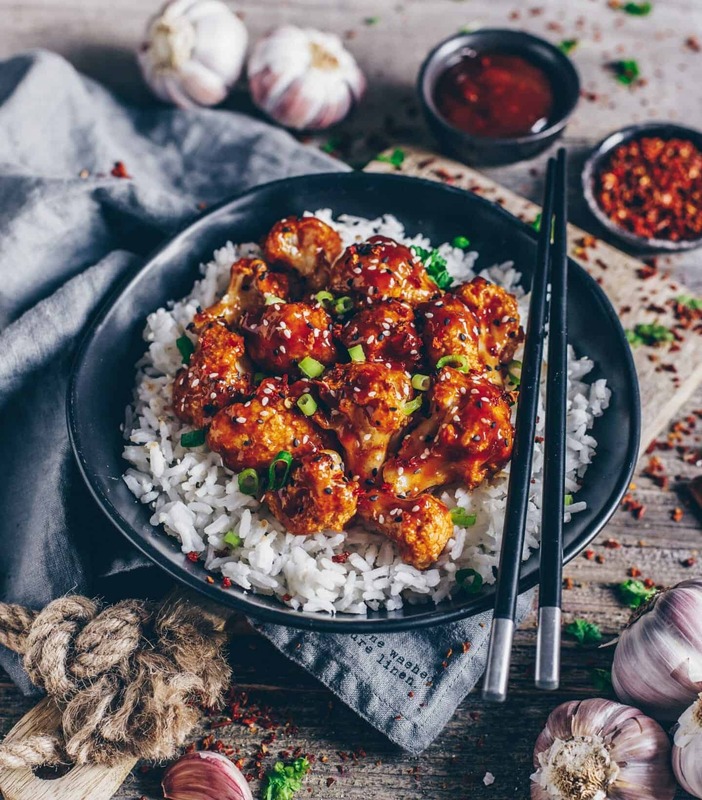 These Barbecue Cauliflower Wings are a healthy alternative to traditional wings. They’re vegan, gluten-free and nearly oil-free – just baked with a few simple ingredients and dipped in a sweet and spicy Homemade BBQ Sauce afterwards. You can serve these flavorful and crispy ’noms’ as side dish, for example to rice but also as an appetizer or snack. I think, they‘d be also a great addition to any party. For this recipe you don’t need many ingredients. Everything you need is just a head of cauliflower, chickpea or other gluten-free flour, plantbased milk (I used soy milk), water, seasonings, a bit of oil and your favorite barbecue sauce to coat. The sauce you use it totally up to you, although I highly recommend my Homemade BBQ Sauce. 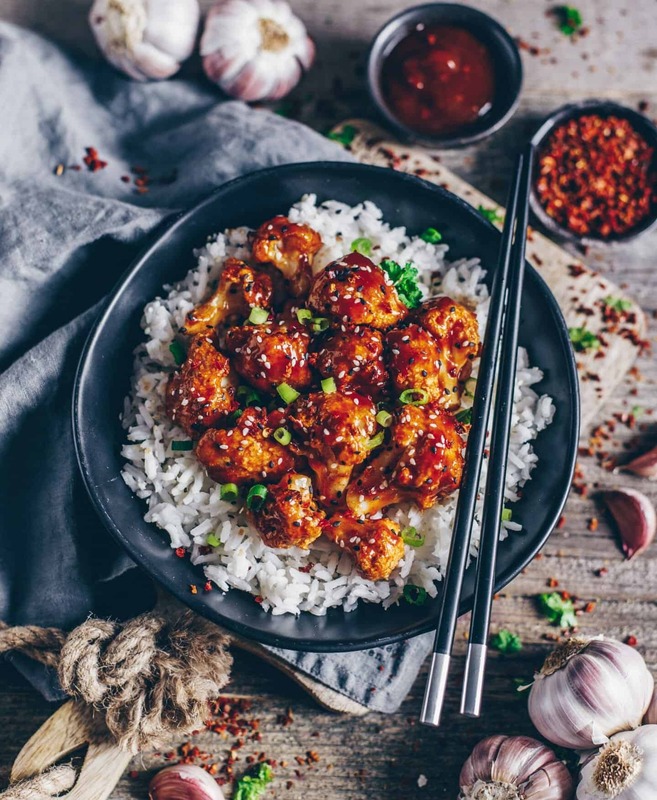 It tastes sweet, spicy and smoky and has no artificial flavors, flavor enhancers and additives which you can often find in store-bought sauces. But if you prefer to buy a sauce for a quicker option nevertheless, I would definitely recommend to check the ingredient list to make sure that it has no weird chemicals. If you prefer more dips, you can for example serve them with my ’cashew herb dip’ or ’guacamole’ or ’ajvar dip’ but also ’hummus’ / ’spicy hummus’ because I mean snacking finger foods makes so much more fun when you dip them. Do you agree? ? Wash and cut the cauliflower head into florets. Mix milk, water, flour and seasonings in a bowl until the batter is thick. Dip the cauliflower one by one in the batter, shake off excess batter and place them single layer on a baking sheet lined with parchment paper. Bake for about 20 minutes until golden brown, flipping the florets over halfway through to get all sides golden brown and crispy. In the meantime, prepare the barbecue sauce: Put all the ingredients in a pot, bring them to a boil and simmer over low heat for about 10 minutes while stirring occasionally. Add more water if needed. If you prefer it more spicy, add more hot pepper sauce or tabasco or chili flakes. Let the sauce cool down. Then combine 1 cup from the sauce with 1 tbsp oil for the marinade. Once the cauliflower is done, remove from the oven and toss all the baked florets with the bbq sauce to coat evenly. Return cauliflower in the oven and bake for further approx. 20 minutes. You can fill the remaining BBQ sauce in a closed jar and store it in the fridge. If serving with rice, then prepare it in this time. 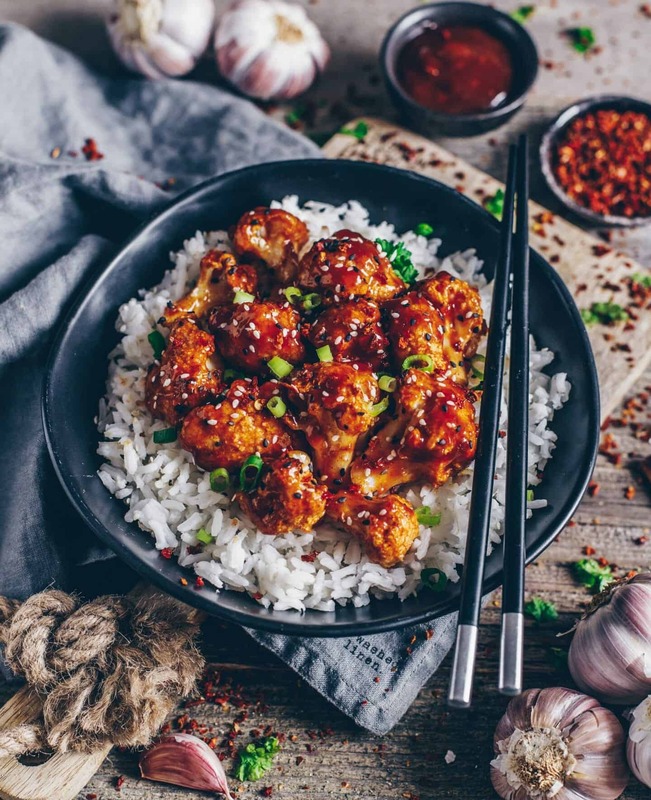 Serve the cauliflower wings with rice (or your favorite side dish) and dipping sauces of choice. Such a creative recipe, Bianca! I love that you use chickpea flour to coat the cauliflower and making your own barbecue sauce is amazing – always so much better than the overly sweet varieties sold at the store. Thank you for your lovely feedback, Nisha ??? I always prefer to make everything by my own because good ingredients are very important for me ? I‘m very happy about that! Made it today and it’s delicious ?? I‘m so happy that you like my recipes. It’s such a great and healthy alternative to normal wings? Dear Bianca, thank you for this incredible recipe!!! It is quick, delicious and healthy. 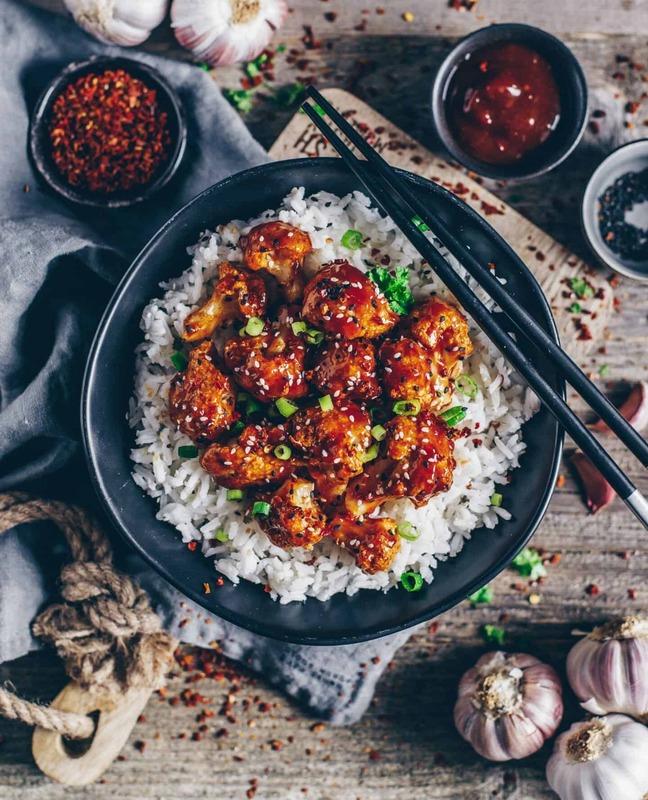 I love homemade food and definitely your cauliflower recipe will stay in my kitchen for good. Those ‘wings’ are truly AMAZING!!! Thank you so much for your lovely words? I‘m very happy that you like the recipe? This recipe works well with so many things, but the cauliflower tastes good just on its own too.